Concrete replaces hand-dug mud steps zigzagging down steep hillsides. Sturdy bridges stretch over marshes, and a main road carves a bumpy path through once inaccessible zones. 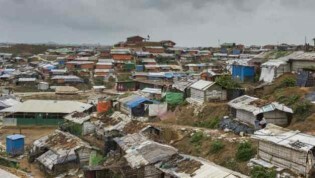 The mega-camp that sprawls across 6,000 acres of Bangladesh’s Ukhia region has changed greatly in the year since it became home to 700,000 additional Rohingya refugees fleeing violence and persecution in Myanmar’s Rakhine state.